Here's a delicious, healthy meal that can be made in less than 30 minutes. Perfect for the weeknight supper! I put this together with fresh veggies from the market and garden. Mix it up with seasonal vegetables. Our 2 year old loved this dish (although he did pick out the kale). 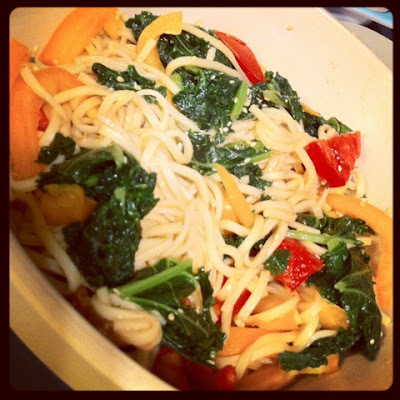 Bring a pot of water to a boil, add noodles, after 4 minutes add chopped kale. Continue boiling until noodles & kale are ready. Drain and rinse. In a small bowl mix together tamari, oils & garlic. Pour mixture over noodles and kale. Mix in fresh, chopped tomato and pepper. Sprinkle with sesame seeds. Posted in "Vegan", "kale", "kid-friendly", "recipe"